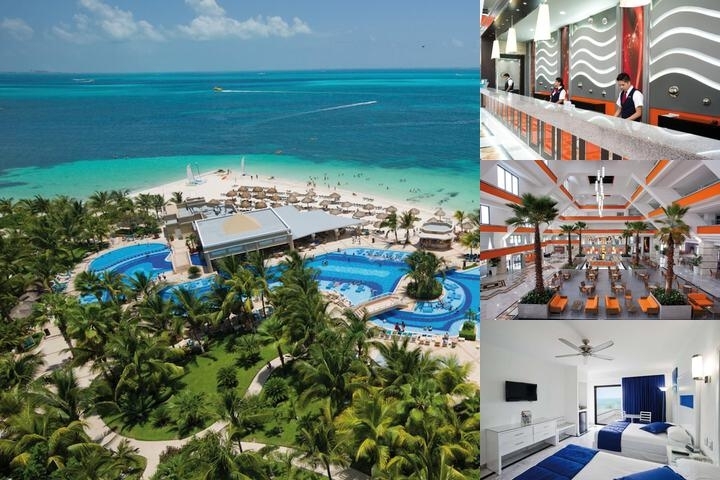 The impressive Riu Caribe All Inclusive Hotel with its Mayan-style architecture overlooking the crystal-blue waters of the Mexican Caribbean is the perfect site for a fantastic holidays. Riu Caribe featrues 506 luxurious oceanview guestrooms with unique Riu amenities such as a mini-bar and liquor dispenser. There is a wide array of restaurants bars and facilities to enjoy including 24-hour all inclusive snacks and beverages as well as a fun and relaxing atmosphere created by the large swimming pool and spectacular beach. This warm and charming resort ensures memorable holidays to suite all tastes.All reservations are based on double occupancy additional children ages 2 - 12 pay 50 percent of the adult rate. The children rate will not apply when there is 1 adult and 1 child in the room. Maximum of 2 children per roomMinimum Age for check in at Riu Hotels is at least one person of 21 years or older in every room - NO student groups under 21 years or Spring Breakers are accepted all year round. During March and April the Hotel reserves the right of admission and therefore we may not admit any room in which all guests are younger than 21 years. - This situation can have serious consequences and should be avoid it at any costDaily free 90-consecutive-minutes WiFi in lobby area and WiFi available in guest rooms with charge.Hotel is All Inclusive - Breakfast/ Lunch/ Dinner/ Alcoholic and Non Alcoholic Beverages/ snacks/ parking/ etc. are included in the price.